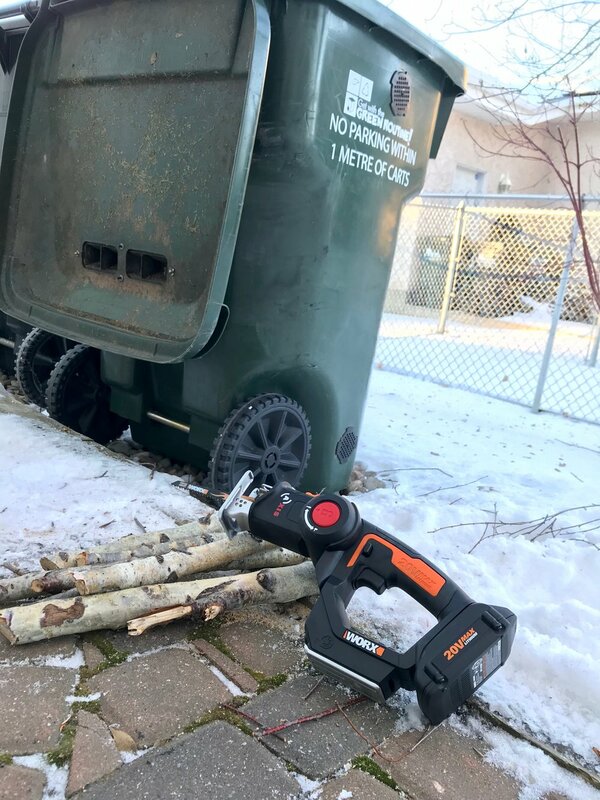 I was recently approached by WORX to review the 20V AXIS Cordless Reciprocating & Jig Saw (WX550L) and at the start I wasn’t quite sure what to make of a 2 in 1 since I already have dedicated single use tools already in my shop. First impressions the tool is a lot more compact that I had originally thought as my existing reciprocating saw is at least double this size alone. The device is well balanced and I was able to use it with one hand when using the reciprocating function. My first real test with the device was cutting down some recently fallen branches we had due to a wind storm. Typically I’d be using a hand saw which is just a pain in the you know what and isn’t fast and efficient. After hauling the branches down to the green bin, I was able to cut everything one handedly in the reciprocating mode so it would fit into the bin. This was short work and was quite pleased with the performance of the tool. Come spring time I know this will come in very handy as we always have a ton of branches to trim and only a small green bin to fit them all. The second test was more inside the garage to see how the Jig Saw feature works. I tested more of the plywood’s and softwoods like pine because I felt that was more in line with the DIY crowd and what they might be using. I started with some ¼” plywood and did a rip cut and a cross cut and the rip cut was clean with little to no tear out, and the crosscut is exactly as you’d expect, some tear out. I then switched to about a ½” scrap piece of pine and do the same as well some quick bends in the cut and both performed very well, clean cuts and was surprised with the ability to turn as quick as I did. Compact and decent performance for an entry level tool. Light and blower feature works really well, never had sawdust collecting. Clean cuts, however this can be achieved with a good blade, so make sure you get yourself some good jigsaw and reciprocating blades. When in jig saw mode, I don’t like how it stands. It’s easily tipped over as you’ll see in one of my videos when I placed it down. Under high stress the tool’s motor does whine. Unknown battery performance at time of writing. In the end this tool serves the DIY market well and is good value for the price. At the time of this blog, Canadian Tire has it listed at $179.99 and Lowes for $149.00. If I was just getting started again as a woodworker or hobbyists I’d seriously consider purchasing this 2 in 1 tool.